As an occupational therapist I do a lot of sensory-based tactile play at my work, because it has many benefits for the development of children of all ages (builds motor, visual, sensory, and cognitive skills). At home, I try to allow my children opportunities to engage in sensory play to allow them to develop their sensory processing skills and build creative, flexible, and higher-level thinking skills. This means that my children are often messy, clothes are stained, and my floors are dirty, but it is worth it! I’ve looked online for “sensory play” ideas, and I found most of the suggestions overwhelming and impractical. Children need the opportunity to engage in tactile play, but it should occur within their normal routines and environments. This series of posts is just of photos that try to capture the ways that tactile play can occur with minimal effort. 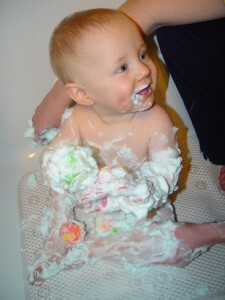 The biggest effort is just allowing your children to explore and be messy and love it (and taking adorable photos). Safety is key, but limiting your baby to only typical toys made of plastic and cloth materials will limit the development of the sense of touch. 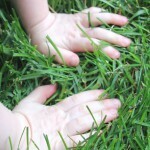 Look for safe objects around the house and in nature for your child to explore (with supervision). Touch and feel with your hand, but also use the whole body. Explore with your feet, face, belly, or back. Just crawling around in only a diaper will explore a whole new sensory world for a baby. 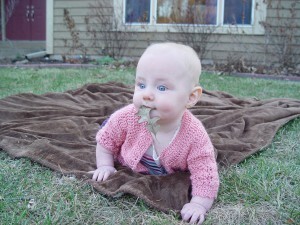 Tactile sense for babies (and toddlers) is all about putting things in the mouth. This is normal and helps them learn. Keep it safe, but give a baby lots of freedom to explore! Typical infant toys are plastic and cloth. Look around for safe objects that are made of other materials, for example Christmas ornaments. 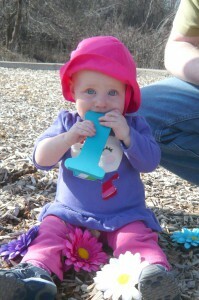 Babies will find everything to put into their mouths- check for safety, then let them explore. Nature provides great opportunities- leaves, grass, sticks, mud… what fun! 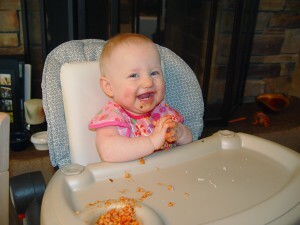 Playing with food helps to develop an interest and enjoyment of health eating. 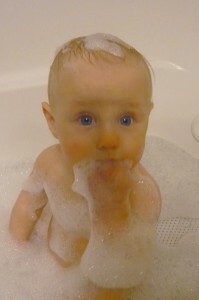 Bath time allows exploration of water, bubbles, wash cloths, and water temperatures. Be adventurous- whip cream! Remember to allow your child to feel with his or her whole body.